Transform two bedroom apartments into a functional workspace. One of the most common struggles of work-from-home entrepreneurs is finding enough space in their rental unit to create a dedicated work area. A study conducted by Steelcase found that 90% of workers were dissatisfied with their business environment, primarily because of a lack of privacy. It’s safe to stay that working from home provides plenty of distractions – to keep your at-home business productive and manageable, creating a work space in your two-bedroom apartment is the first thing you should be focused on. 50% of the U.S. work force telecommutes, and it’s easy to see why so many Americans choose to work from home. The ability to telecommute to work gives employees and entrepreneurs a chance to maintain a flexible schedule, among other benefits. But this exciting opportunity doesn’t come without obvious challenges as well, the most common of which is arguably productivity. Being able to focus on work instead of other “at home” activities can be a struggle. Finding ways to divide “work” and “home” life is one of the common complaints of telecommuting workers. Thankfully, keeping a home office is the most realistic way to ensure you’ll have privacy during work hours. If your home office is going to be productive, you need to get prepared. Take a look at a few ways successful telecommuters set up their at-home office space. The first step to setting up a home office is to find the most productive space to set up your desk and tools. If you have an unused bedroom, consider using this as a dedicated office. If an entire room isn’t at your disposal, find a quiet corner of the kitchen or living room. What “tools” are absolutely crucial to your job? A desk, computer, and phone are three common tools telecommuters use to stay organized and productive. Depending on your profession, it’s likely you’ll have plenty of other resources (like filing cabinets, a printer, etc.) to incorporate into your work space as well. Staying organized can make the difference between a productive week and a completely wasteful one. To ensure your time working from home is well-spent, invest in different types of “space savers” like filing cabinets, wall organizers, computer cord organizers and more. Working from home offers a number of benefits, but one of the cons of maintaining a home office is dealing with unrelated noise. The noise from loud neighbors, family members, and roommates are all things telecommuting employees have to deal with on a regular basis. To drown out unrelated noises, consider listening to relaxing music on a pair of headphones or speakers. There’s a reason successful businesses keep bookshelves in their offices. As a work from home employee or entrepreneur, creating a dedicated space to house books and work ledgers is a great way to keep your paperwork organized without cluttering your desk space. Transforming even the smallest two-bedroom apartment into a productive work space is easy if you take the time to plan ahead and stay organized. 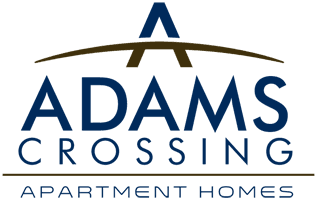 Adams Crossing welcomes telecommuting workers and work-from-home entrepreneurs who are able to provide reasonable proof of income.